Adding bright blooms such as Tulips to our winter days is something us sunny South Africans love to do! In an ideal world, we would want Tulip-season to stay as long as possible. So, we are here to help you make sure these tremendous florals stay blooming for as long as possible. Choosing the right vase is key. It must cover at least half the height of the tulip stems. The tulips do love to stretch out and will usually grow upwards, approximately two inches in height during their vase lifetime. 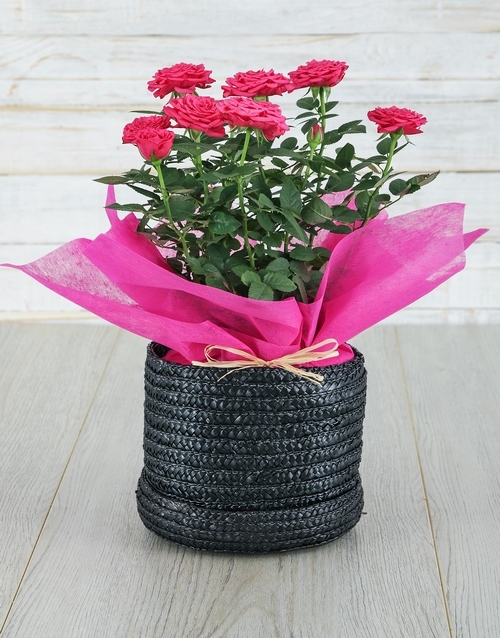 Give them space to stretch out in the vase and arrange them so that they don’t clump together. This also helps to reduce petal loss. 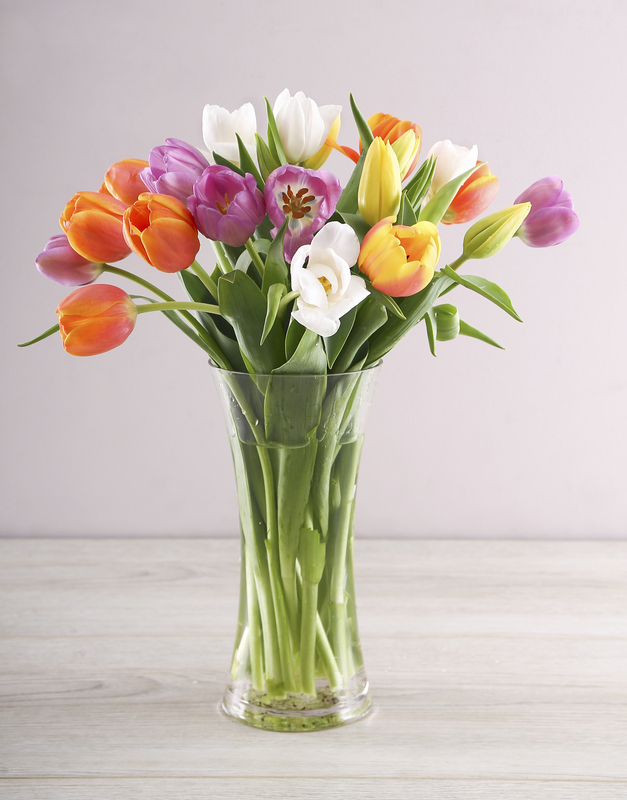 Tulips grow after they’re placed in the vase, so we suggest holding the bouquet to the right side of the vase first, and cut the stems to make sure the blooms are the exactly the length you prefer. Cut the Tulips at a 45-degree angle – this creates a ‘straw-like effect’ and allows the stems to soak up the fresh water. Cold, fresh water is best. Some garden gurus suggest 3 blocks of ice in the water per 6 flowers. Tulips will drink a lot of water. 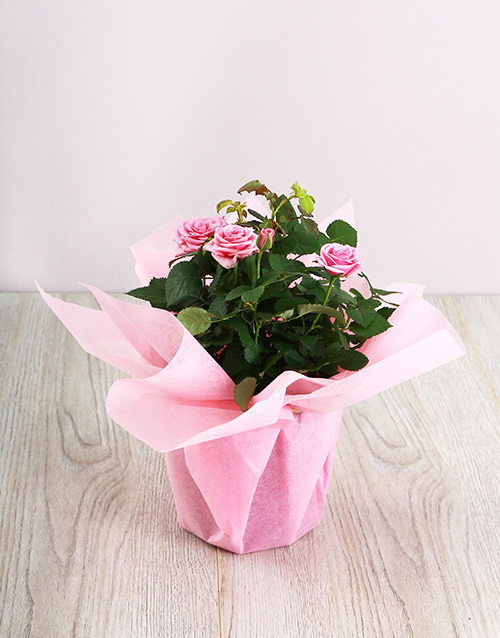 We suggest changing the water every 2nd day and giving the stems a fresh trim when you change the water. To keep your blooms blossoming, you can also add flower food. For less conventional solutions, throw a 5c coin at the bottom of the vase, or add lemon juice, or half a teaspoon of regular cane sugar. Tulips are “photosensitive,” meaning they grow and open based on the sunlight they are exposed to. 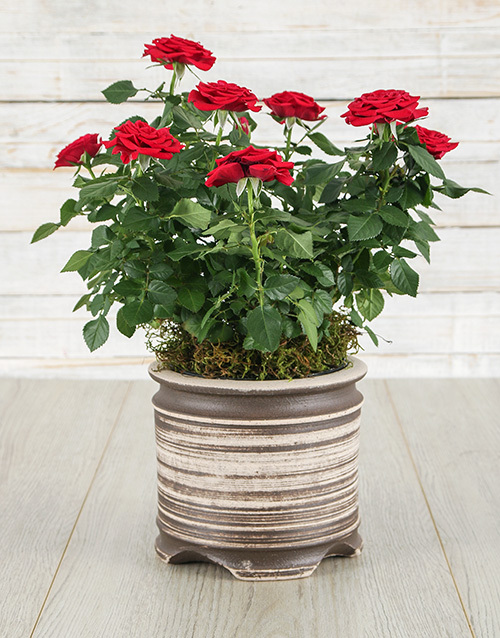 You should avoid placing the vase in direct sunlight or heat, as they’ll wilt faster once the blooms open up. To achieve maximum floral life, you want to receive tulips at an ‘early’ cut stage or ‘closed’ stage,” like in the bud. Once the Tulips have reached the ‘open’ stage, the life of the flower is sadly quick. Just remember a little bending at the stems is natural for tulips as they “stretch” towards the sunlight, but if the stem looks “floppy,” that’s not a good sign. 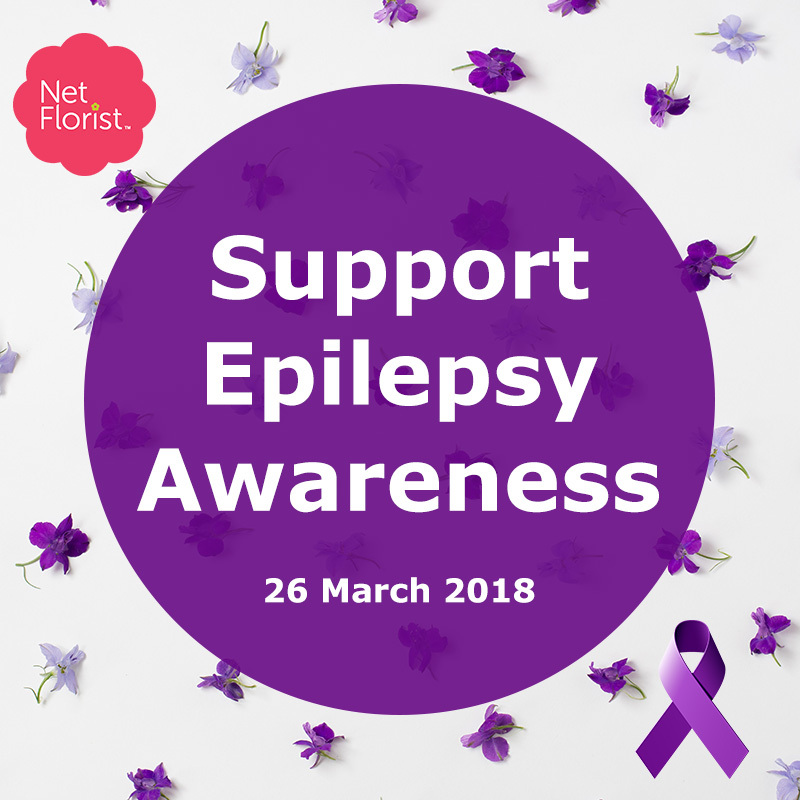 If you want to include other flowers in your bouquet, one should be mindful that tulips are very sensitive to other flowers. Some other flowers that affect the tulip life cycle are daffodils or narcissus as they emit a substance that will make tulips wilt faster. Tulips are gorgeous enough to be placed in a vase all on their own. Red tulips are the perfect gift for any occasion. They have the power to brighten up anyone’s mood and home. With winter around the corner and people unsure of what will leave a lasting floral scent and memory in the home, Tulips are the perfect purchase. 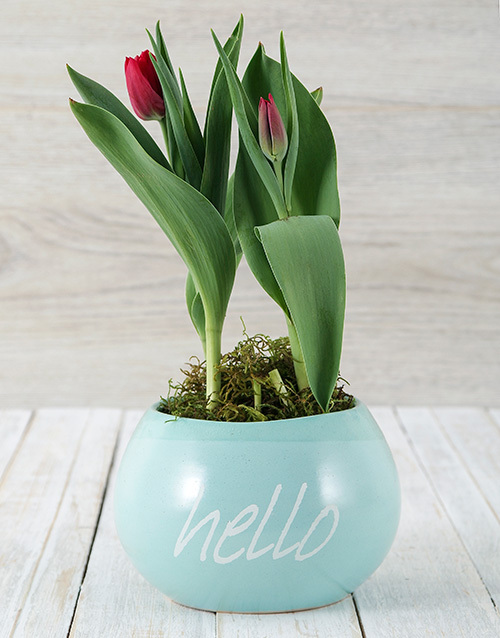 Send these amazing red tulips planted in moss in a gorgeous, keepsake ceramic pot to a special friend or loved one and be the reason for their smile. 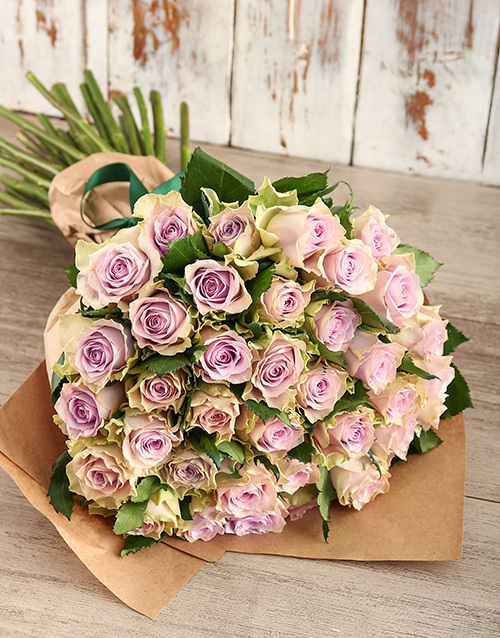 Order this beautiful plant with NetFlorist! Colour of the plant may vary. 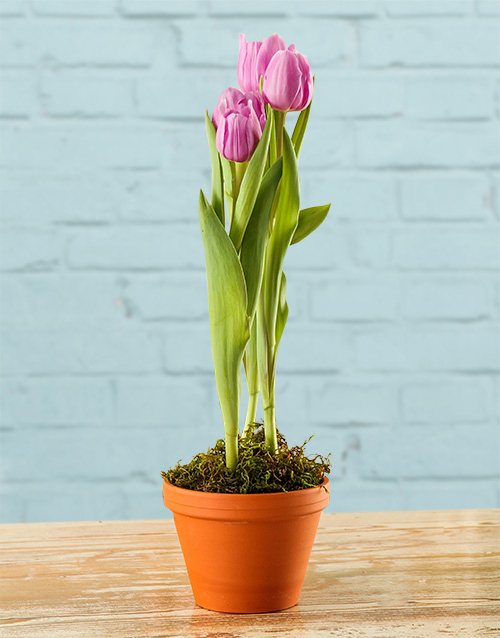 Be the sender of smiles with a sunny purple tulip plant which is presented in an orange ceramic pot with moss. It will take pride of place in any home or office! It is also a great price for a lasting gesture. 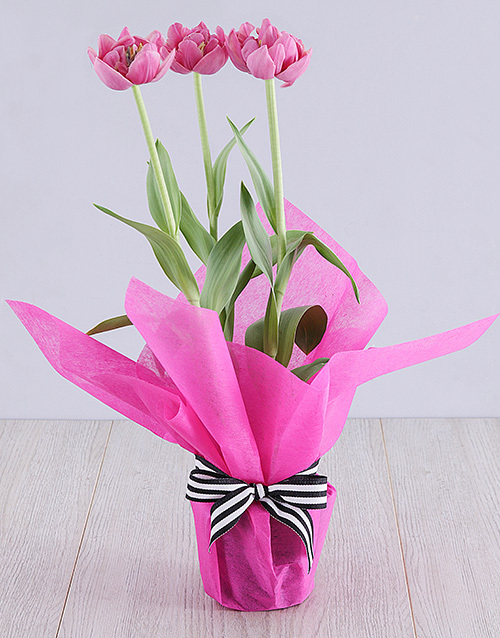 Make someone’s day with a gorgeous purple tulip plant which comes presented in cerise tissue paper with a special black and white striped ribbon. Send now! 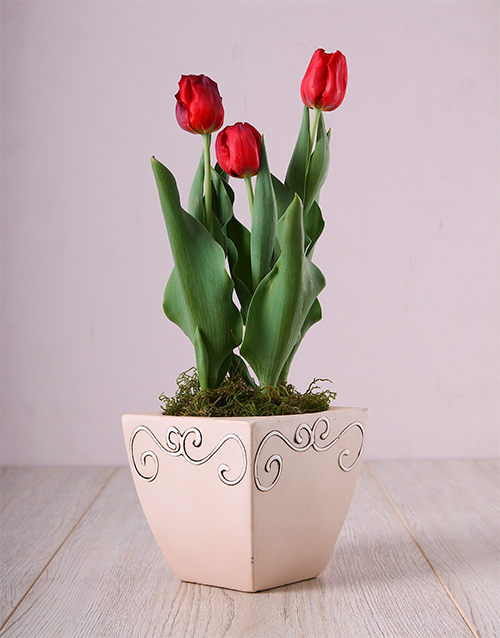 Say hello there with this lovely red tulip plant, which comes presented in a ‘Hello’ pot with moss. It works well in the welcome area of any home, hospital or workspace. Orchids need a lot of water, but should also be allowed to dry out a bit in between waterings. One way to check for enough watering is by poking your finger about an inch into the growing media. If it’s dry, give it some water; otherwise, let it be. Indoor orchid plants also need adequate humidity – about fifty to seventy percent. You can place a water-filled saucer or tray of pebble stones under the plant, mist the plant daily, or use a humidifier to help with correct conditions. 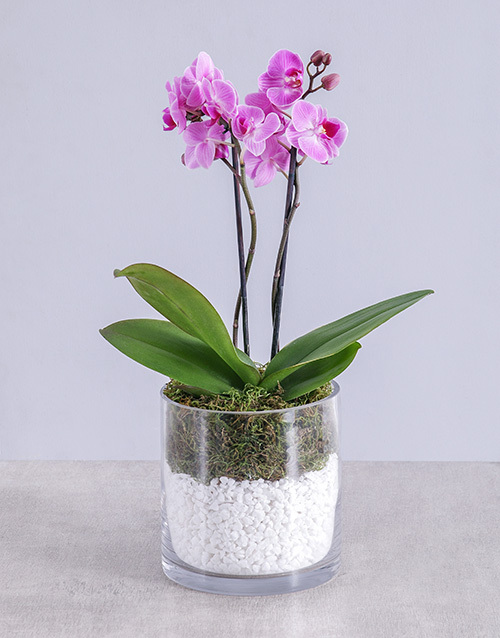 Orchids need to be placed near a south or east-facing window that receives indirect light. Make sure the room your orchids are in receives circulation, or instead, set an overhead fan on low if it doesn’t get enough air flow. Orchid pots must be equipped with drainage holes to allow excess water to run out of the pot. Otherwise, the root may rot maybe even killing your beautiful plant! Orchids will die if they get too cold. You should cut off spent stems when the flowers have died. Orchids do not flower more than once on the same stem, with the exception of the Phalaenopsis, or Moth Orchid.